I received two press releases today from PCGS. The first is a short summary of the issue, while the second provides some very interesting details about the minting process of the counterfeit Morgan dollars. (Newport Beach, California) – The so-called “Micro O” variety New Orleans Mint Morgan silver dollars dated 1896, 1900 and 1902 are actually deceptive, contemporary counterfeits, according to research conducted by the Professional Coin Grading Service (PCGS) of Newport Beach, California, a division of Collectors Universe, Inc. (NASDAQ: CLCT). The authentication and grading company will no longer certify additional specimens, and will offer a refund of full market value for current owners of PCGS-certified examples. PCGS has certified 95 of the contemporary counterfeit “Micro O” Morgan dollars over the years: 26 of the 1896-O; 31 1900-O; and 38 1902-O specimens. Recently, several dates in the Morgan dollar series have come under new scrutiny. Collecting VAM (Van Allen-Mallis) varieties has been popular since the publication of the first edition of the Leroy Van Allen-George Mallis work on silver dollars in 1965. Today, there are many new collectors of the popular varieties and prices have skyrocketed for the rarest issues. The New Orleans Mint used several different sized mintmarks, including one called the “Micro O,” first appearing on silver dollars in 1880 from that mint. All mintmarks at that time were added to the dies in Philadelphia before they were shipped to the various branch mints. So, it was not unusual for different sized mintmarks to be applied to the dies of the various branch mints - some years had several different style and size mintmarks used. So, having Micro O mintmarks in several different years is neither unexpected, nor unusual. 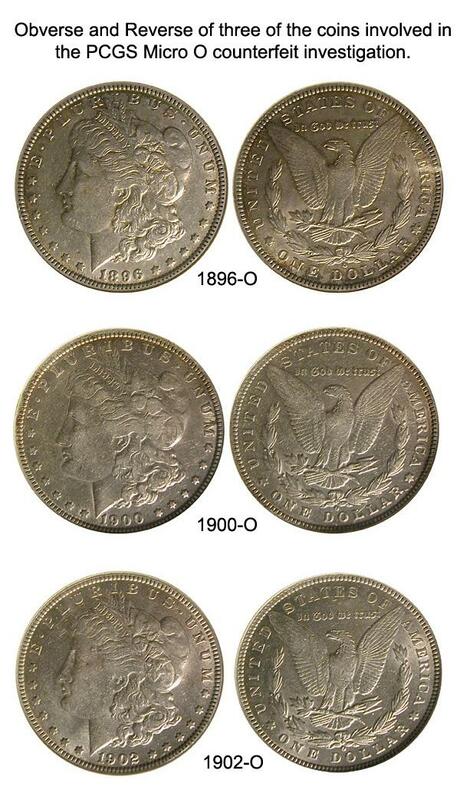 However, grading and variety experts at PCGS have recently uncovered undeniable evidence that three of the so-called Micro O Morgan varieties, the 1896-O, 1900-O, and 1902-O, are actually contemporary counterfeits, most probably struck outside the US Mint sometime in the early 20th century. This is a significant discovery and one that will certainly have an impact on Morgan dollar variety collectors. The discovery of the contemporary counterfeit status of the 1896-O, 1900-O, and 1902-O Micro O Morgan dollars came about as PCGS experts studied an unusually high number of these coins that recently were submitted to PCGS for certification. These three varieties are rare and even very low grade examples sell in the $500 range. PCGS usually examines these coins one at a time. However, PCGS recently had the opportunity to examine a larger group of these coins and do in-depth analysis of their die characteristics. What was most suspicious about this group of Micro O Morgan dollars was that three years shared a common reverse! 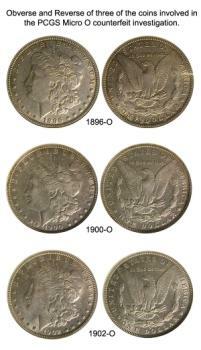 The Micro O dollars of 1896, 1900, and 1902 all used the exact reverse die. This is beyond unusual. Although it was common practice at the various United States Mints to keep reverse dies (or obverse dies if the date side was the reverse die) that were still serviceable, using a die over such an extended period is unusual - and suspect. After examining the group of coins, it became apparent that these Morgan dollars were not struck in the New Orleans Mint in the years indicated by their dates. In fact, they were not struck in the mint at any time. These coins are among the most deceptive copies of United States coins seen. It is probable that they date to the early part of the twentieth century, but may have been struck as late as the 1940’s. They have been known to numismatists since at least the mid-1960s. Who would attempt such a feat? With the price of silver on the open market at prices much cheaper than the official price (25-50 cents for much of the first half of the twentieth century versus the official United States rate of $1.29 per ounce), the temptation to produce silver dollars with the “full” amount of silver and pocket the difference was irresistible to someone. In fact, one of the suspect coins was sent for elemental testing and it came back 94% silver and about 6% copper! It contains even more silver than a genuine United States silver dollar. However, even with extra silver and the work needed to create the dies and planchets, the profit from these coins would have been tremendous. Certainly, this was a temptation to hard to resist. The 1880 or 1899 may have been the model for this reverse die, as both have a Micro O mintmark that is tilted to the right and in the same general position as the reverse die used on the other three dates. • The fuzzy look seen on the higher-grade examples is unlike any genuine United States silver dollars. The fuzzy nature of the letters, eagle, and other devices indicate transfer dies. • All the higher grade (Extremely fine and better) coins we’ve examined appear to have been artificially circulated. This is noted by the “sweated” look seen when coins are tumbled with other coins. Since uncirculated coins would have been more closely scrutinized, these coins were made to look older and likely were mixed in with other circulated genuine silver dollars. Fifty or so of these coins mixed with hundreds of genuine circulated silver dollars would have raised no suspicion. If they had been left in their “natural” state, someone likely would have noticed the improper luster and look of these coins. Tumbling coins to simulate circulation is a common trick of the ancient coin market frauds. The fact that there are no uncirculated examples known of these three varieties is further proof that they were artificially circulated. So, these coins were not made to deceive today’s variety collector. They undoubtedly were made in the first half of the 20th Century to take advantage of the difference in the market price of silver and the value of the United States silver dollar. PCGS has certified 95 of these contemporary counterfeit Micro O coins in the past: 26 1896-Os; 31 1900-Os; and 38 1902-Os. For anyone who currently owns a PCGS graded example of these contemporary counterfeit Micro O Morgans dollars, PCGS will reimburse the owner for the current market value of the coin(s) under the terms of the PCGS Grading Guarantee. Anyone who wants to take advantage of the PCGS Grading Guarantee for their Micro O Morgans should contact PCGS customer service. PCGS will no longer grade these three dates with Micro O’s. (1896-O, 1900-O, and 1902-O). The 1899-O with Micro O is an unquestionable Mint product and will, of course, continue to be certified by PCGS. Interestingly, many in the numismatic community likely will still collect these curiosities. They are such good copies that they have circulated with genuine silver dollars since they were made. As with some Colonial issues, collectors strive to complete their sets and include circulating counterfeits of many issues. When the copy is good enough to fool the rank and file, the imposter has no trouble traveling in the circle of genuine coins.